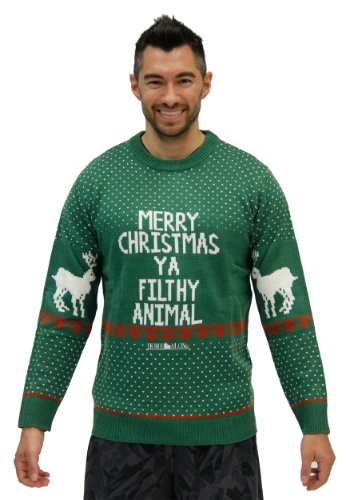 If you're one of those people who love to watch Home Alone every Christmas season then you certainly recognize the quote on this sweater. Nothing says Christmas like a kid setting up booby traps for a couple of bumbling robbers and conning fancy hotel staff into letting a child rent a room! Sure, it may have been odd that Kevin had the "classic" film Angels with Filthy Souls memorize. And it sure was convenient that the old man got really mad, had the perfect dialogue, and resolved the tension with his tommy gun. But that's just part of the holiday magic of this movie. So, if you've always loved the film and you've always wanted to tell people, "Merry Christmas ya filthy animal," but never dared, now you can with this hilarious sweater. Just, whatever you do, make sure you're getting on the right flight with your family this year. We're not sure adults can get away with those unforgettable Home Alone antics.